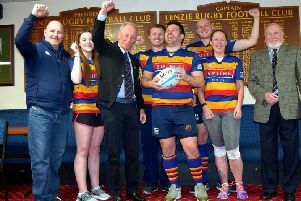 The 17-year-old Lenzie Academy pupil put in a strong and spirited performance as blindside flanker as her Stirling County under-18 girls’ team took the trophy. They secured the silverware with a 36-26 victory over Hillhead Jordanhill and a closely fought final at Murrayfield. Kirsty has been playing with Stirling County since 2014, just after the Commonwealth Games. At that time under-15 and under-18 girls rugby was a very small affair - neither Stirling County nor Hillhead Jordanhill had enough players to produce a full team so the two teams joined forces for the duration of the competition and managed to pull off a win against Edinburgh Wanderers in the final. Kirsty and several of her team mates are involved with the Scottish U20 women’s Performance Development Programme run by the SRU. These girls were selected from across Scotland for regular coaching and teaching days at Murrayfield and at West Rugby Club throughout out the year. They not only receive high level rugby coaching but also teaching on nutrition, fitness and medical matters.